In the gauntlet scene in The Bride With White Hair: Brigitte Lin's character, an orphan who was raised by wolves, must walk a gauntlet in order leave the evil cult that took her in, taught her martial arts, and trained her to be an assassin. The gauntlet is a brutal test that no one has ever survived. 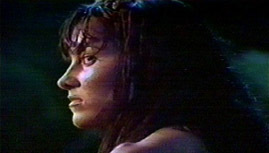 In the gauntlet scene in HTLJ: The Gauntlet: Xena's army is taken over by her second-in-command, and she is forced to walk the gauntlet, a brutal test that no one has ever survived.